New Winter 2018: It's a memorable thrill for both generations when a great grandmother and child make Christmas treats together for the holidays. The baking cookies with great grandma 1 child Christmas ornament personalized from Russell Rhodes becomes a cherished family keepsake from the very first time it is displayed on the tree. These grandparents ornament can be customized where shown, but our artists use a beautiful hand-painted font. There is room on the reverse side for us to add your longer message, at your option. 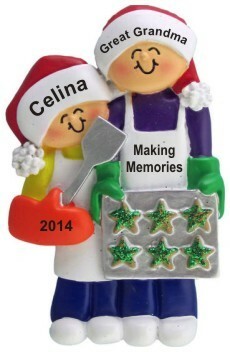 Celebrate precious moments together with the cute and festive great grandmother and child baking cookies ornament personalized for added fun. It ships in our classic velvet gift pouch.